Lens accessories for smartphones are by no means a new idea, but they’re often clunky, awkward to use, and far from something you’d want to try and squeeze into your pocket. These Blips lenses are a different story: They attach to your smartphone like a piece of tape, and are slim enough to carry alongside your credit cards. Available in two different versions: a macro lens with 10x magnification, and a micro lens that can make individual cells visible, the Blips lenses are just millimeters thin, and use electrostatic charge to stick to your smartphone camera’s existing lens. Attaching them is as easy as applying a band-aid, and removing them is even easier. The lenses are so thin, you can actually just leave them attached to your phone and still slide it into your pocket. The Blips lenses are smartphone agnostic; however, their magnification capabilities vary depending on the device being used, and how its camera sensor and standard lens are configured. You’ll want to make sure all surfaces are clean and dust-free before installation, otherwise all you’ll be seeing is the dust and grease trapped in your fingerprint. 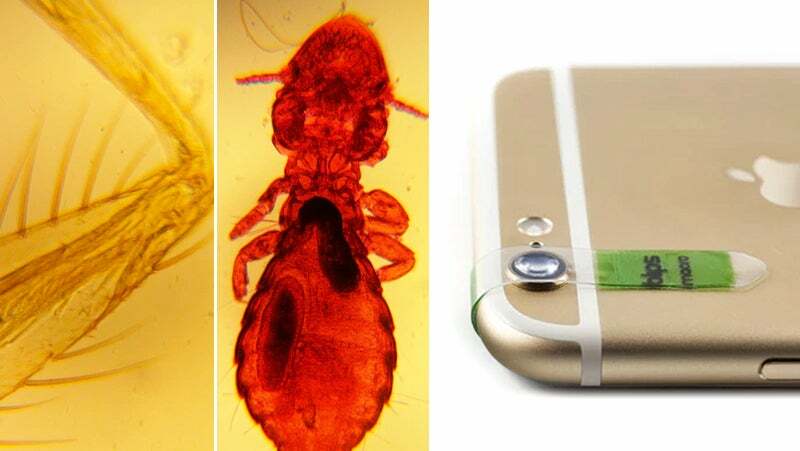 And when it comes to turning your smartphone into a microscope, you’ll need a lot of light illuminating your subject so all its minute details can actually be seen. The Blips’ Kickstarter campaign has already successfully raised the roughly $17,000 in funding it was after, but you can still pre-order a set of the lenses with a donation of around $23. The campaign says you can expect delivery sometime in September. They’re completely smartphone agnostic and should also work fine on a tablet if you insist on using that as your primary camera. The lenses even come with a free accompanying app that’s optimized for shooting and easily locking focus on your close-ups shots. But your preferred camera app will also work just fine. This includes Instagram, so you can finally share images of the grossness that’s been lurking under your fingernails.